Thank you to Vineyard Vines for sponsoring this post. All opinions are my own. The Kentucky Derby is quickly approaching. It’s such a big event in Kentucky–even if you’re not at the Derby, you’re watching the Derby. We always all pick a horse to win. 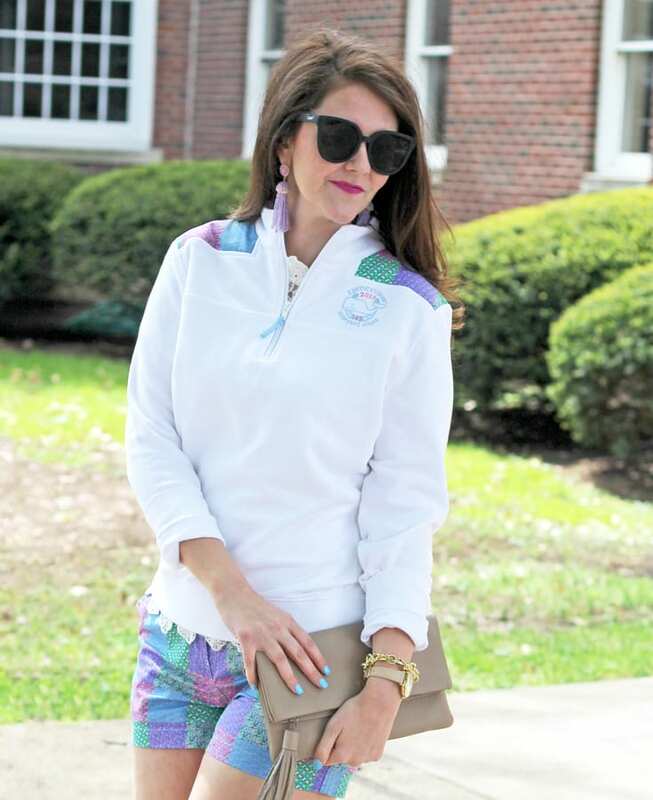 I always pick my horse based on the name that resonates the most with me.haha Derby parties are so much fun, so I wanted to share a casual Derby Day outfit featuring Vineyard Vines’ Kentucky Derby 2017 collection. 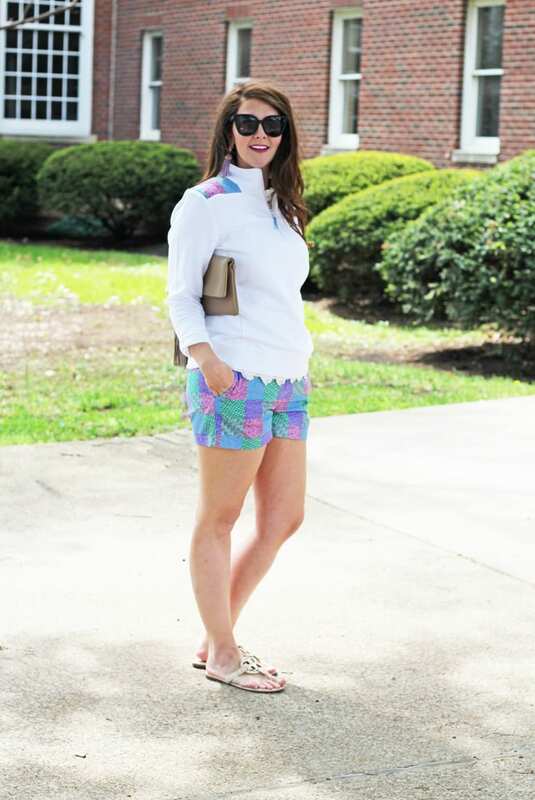 Pullover: c/o Vineyard Vines // Shorts: c/o Vineyard Vines // Lace Top: Who What Wear via Target (similar, similar, similar, similar) // Earrings: c/o Southern Belle Glitz (comes in 12 colors) // Clutch: Gigi New York // Sandals: Tory Burch via Ebay // Sunnies: Quay–only $50! 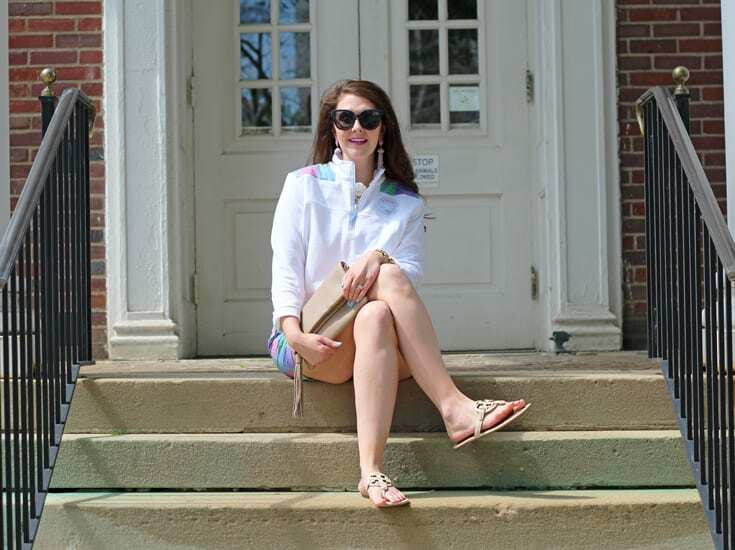 While a popover and shorts may seem like a simple outfit, I wanted to mix things up for my Derby Day party look. 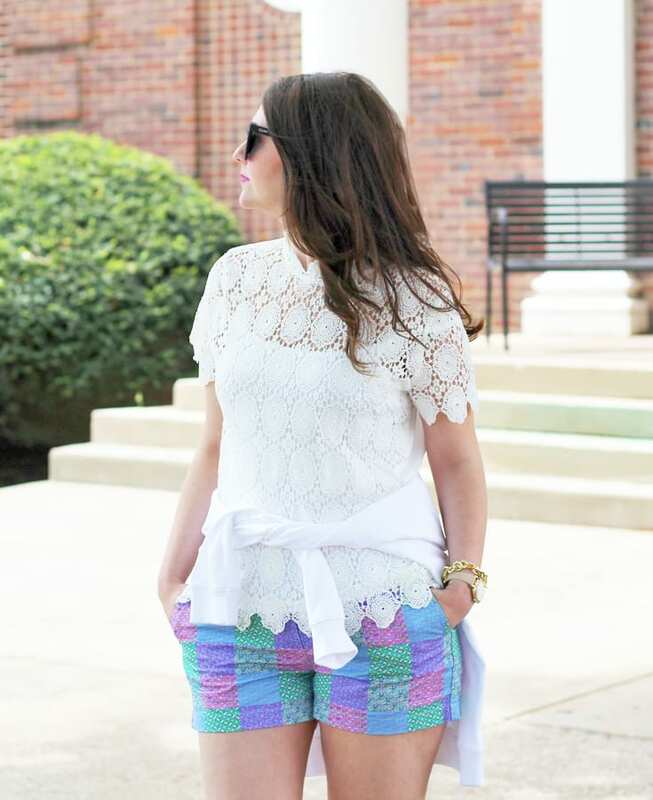 So I added a crochet lace tee under my popover that really dresses up the shorts. 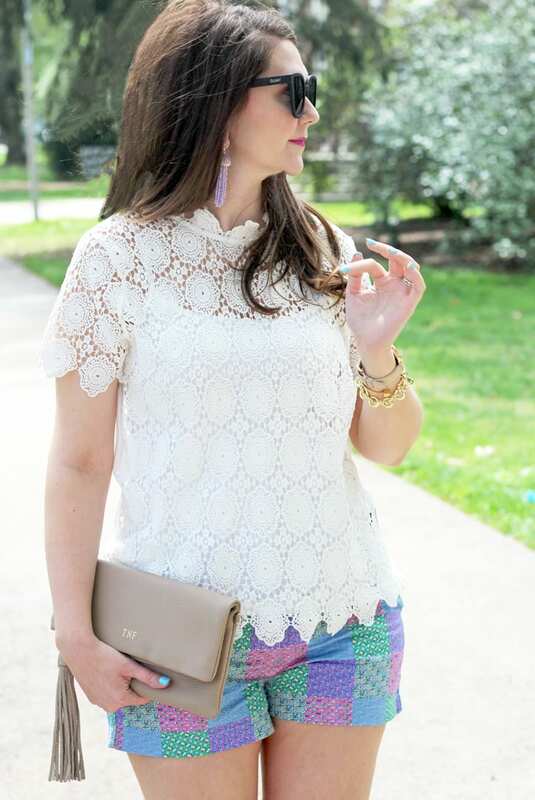 I love how the lace details show at the neck and the hem of the popover. It adds a fun, unique twist to the outfit. For accessories, I decided to forgo a necklace, so I just added a pair of tassel earrings that picked up the purple in the pattern. 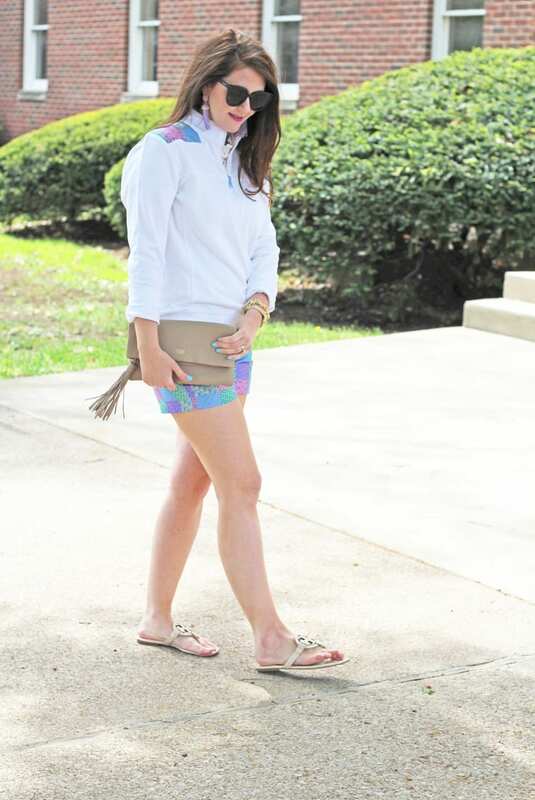 My shoes and bag are great neutrals that allow the colorful pattern of the outfit to shine. 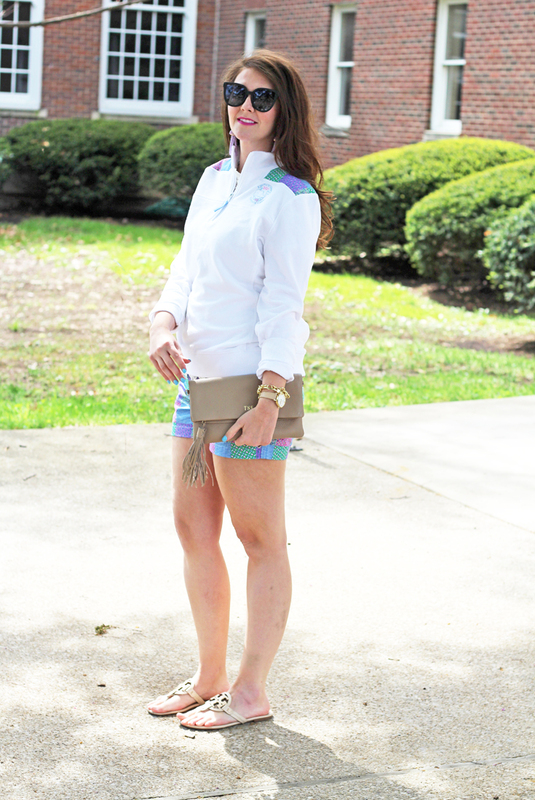 Vineyard Vines has so many great pieces in their Kentucky Derby collection! If you’re looking for something more dressy, checkout their Derby dresses, fascinators, and hats. They also have several tees for an even more casual look. I snagged this one. 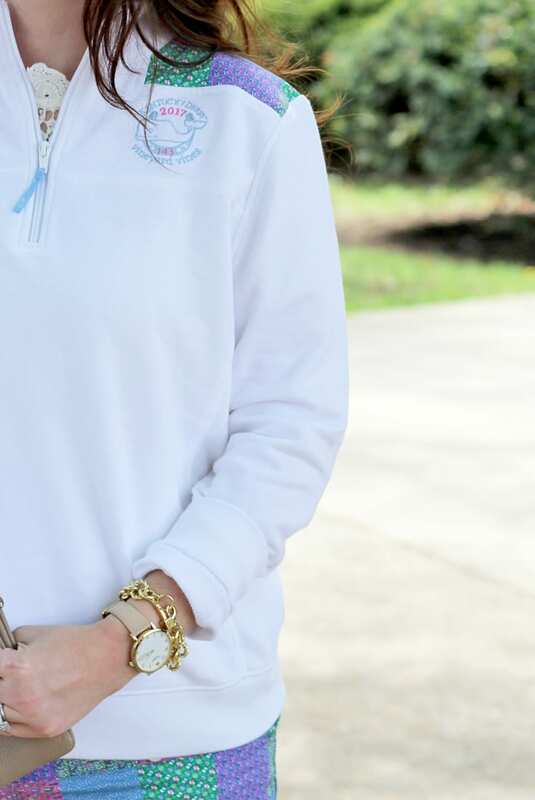 Also, it was recently announced that Vineyard Vines will be coming to The Summit at Fritz Mall in Lexington, KY later this summer! If you live in central Kentucky, stay tuned for more details regarding an exact opening date. Do you watch the Kentucky Derby??? AND NOW FOR THE GIVEAWAY!!! 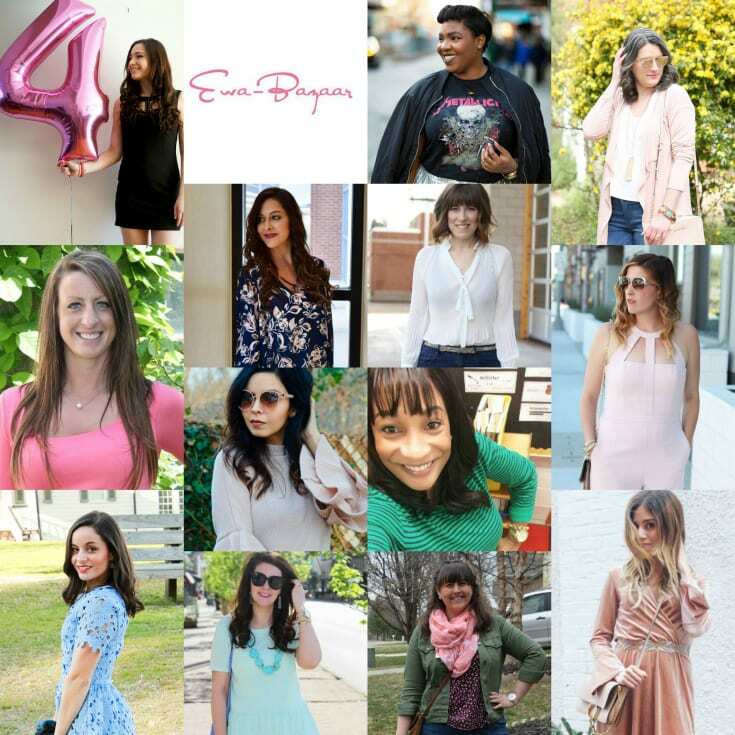 I’ve teamed up with some fabulous bloggers to help celebrate Jersey Girl, Texan Heart’s 4th Blogiverary!!!! 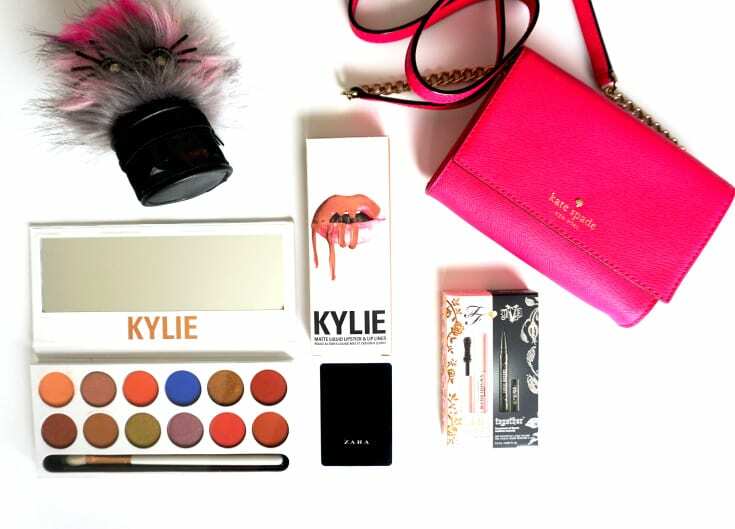 ENTER VIA THE WIDGET BELOW FOR YOUR CHANCE TO WIN EVERYTHING SHOWN IN THIS PICTURE!!! **PLEASE READ FOLLOWING GIVEAWAY RULES CAREFULLY: Since this is such a big giveaway we will write the rules out for everyone instead of just putting them in the giveaway widget. This time around your host (Jersey Girl, Texan Heart) will be checking every single entry due to the amount of items being given away. MUST follow at least one of your host’s (Jersey Girl, Texan Heart) social media accounts below. If you are a “repeat offender” (someone who (the host) has followed then unfollowed throughout her giveaways) you WILL be disqualified. The host apologizes for this new rule they know everyone loves free stuff, but it’s only fair to the other people who have entered every giveaway and still loyally follow.